I’m no wildlife expert but Caithness is a place with very accessible wildlife. It is worth keeping an eye out as you explore the area. Our list is by no means exhaustive. For more information on wildlife visit the information site at Dunnet beach where the Highland Rangers are based. They also do guided walks. For a more personal, bespoke tour contact Kate at Caithness Wildlife Tours they will even come and pick you up. Due to our closeness to the sea, birds can be seen from nearly any point along the coast. For example, many species of bird on Thurso beach feed at the turn of the tide. The same may be said for the river at Wick especially at low tide. The cliffs at Duncansby, Dunnet and Holburn Head are also all excellent places to look for sea birds. Puffins are one of Caithness’s most recognisable birds because of their colourful beaks, they are more difficult to spot as they only nest in particular areas at certain times of the year. However the Ranger Service do puffin walks most weeks when they are active, we can let you know when these are happening. The RSPB centre at Forsinard also do walks with bird observation in mind. For any bird watching enthusiast St John’s Pool is a must. Their website catalogs what to expect to see and some of their rarer bird sightings. Caithness offers habitats which are scarecly found elsewhere in the UK for moths. The website listed below gives detailed information on the wide range of species that can be found in the area. If you like getting out on the water there’s even more to see in the sea. Harbours, castles, sea caves, stacks all look a little more impressive and there is a better view of the cliff bird colonies. Adventure trips with Caithness Seacoast are very regular leaving from Wick harbour. Their website alone is worth visiting for the photos and they regularly post whale sightings etc on their Facebook page. Over the last few years along with the increase in seals we have had an increase in the number of orca “killer whale” sightings around Caithness. 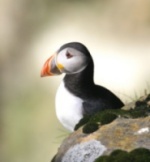 Many of our guests have seen them especially when taking the ferry to Orkney. We have even seen a pod in Thurso Bay – a little disconcerting for the surfers. To get information on marine sightings of whales and porpoises around the Caithness Coast as well as excellent photographs of what can be seen (on land as well as sea) this Caithness Sea Watching Page is very good. Also this guide to the “Wild Coastal Trail” gives a good sample of what can be seen and when. Can be seen almost every day during the tourist season on the little island in the middle of the Thurso river in the middle of town. The bottom of the stacks at Duncansby is also a good place to find them. Generally seals are very common in the area and on many beaches you will find them. Harbours such as Portskerra, Lybster etc. are also excellent places to see them. Salmon leaping is a common site in late summer – watch for fishermen and you are almost bound to see some on any river. The falls at Forss and at the Falls of Shin (on the way up) are two places known for the salmon leap. Here’s a preview. The rare flower, Primula Scotia, is native to only Caithness, Sutherland and Orkney. These are incredibly hard to find however around the lighthouse at Strathy Point you can find them during their flowering months (they are tiny but once you spot them there are lots). Lichens are abundent on trees, fences and rocks in the area. 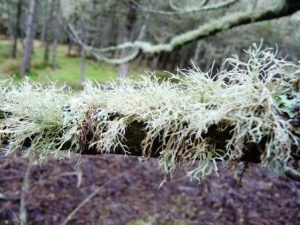 The presence of lichens is seen as a good indicator of low levels of pollution. The clean air in Caithness results in many ‘hairy’ trees particularly in Dunnet forest. The “bog walk” at Forsinard is also remarkable. If you get a change to stop on your way north, I would highly recommend it. Although quite rare, otters can be occasionally seen at the mouth of Thurso river by the harbour. They are most likely to be seen early morning. Along the river at Halkirk is also a good spot. 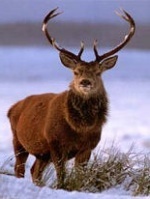 Deer can be found on Morven, along the road between Strathnaver and Kinbrace and in most forests eg Dunnet Forest. You are more likely to see them early in the morning. You don’t even need binoculars.